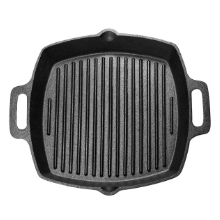 A wonderful addition to any cookware collection, Bruntmor's Pre-Seasoned Cast Iron Square Grill Pan with Drain Spout and large loop handles. 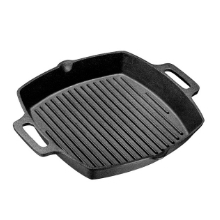 This 13 inch pan works well for making crispy bacon, grilled sandwiches, seared meat chicken or fish for a classic barbecue taste. 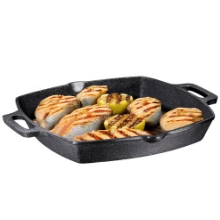 The pan’s raised ridges impart delicious seared marks on food, similar to those created by an outdoor grill. 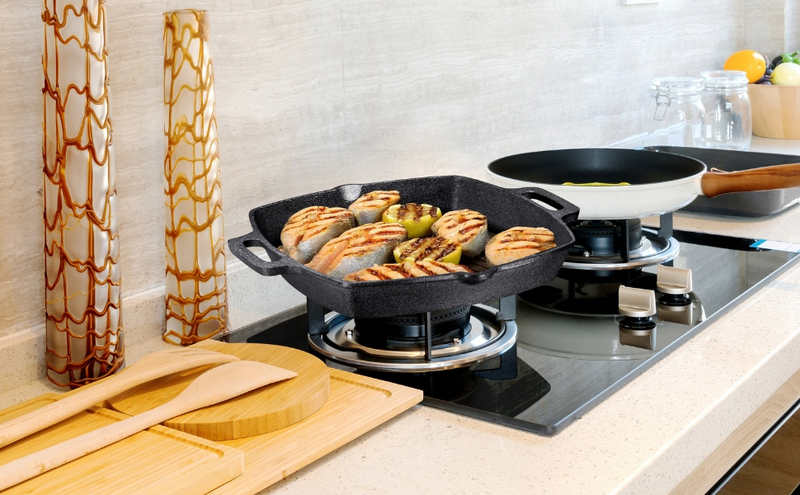 The versatile cookware moves seamlessly from stove top or oven to the table for serving and easier cleanup. Gets better with time- pan gets better and more flavorful with use over time, for lasting durability with proper care. To keep delicate foods from sticking, wipe pan with light coating of oil before cooking. 13 Inch Pan with easy grease drain spout and large loop handles. Usable in all kitchens: gas, electric, induction, oven, camping, grill etc. 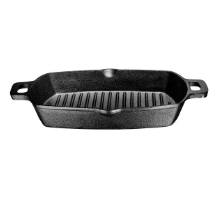 Victoria cast iron skillets include instructions on use and care to upkeep and improve seasoning with time. Excellent heat conduction and retention. Preheat your cast iron before adding your food to the pan. Cast iron can take a few minutes to get up to the right temperature. Keep some pot holders nearby at all times. There aren’t any cool spots on cast iron pans, so be prepared to use heat protection to move things around as needed. Preheat your smoker or oven to 250 degrees F.
Wrap each filet with a slice of the thick cut bacon. Secure with a toothpick. Season the steaks pretty aggressively on all sides with the salt and pepper. Smoke (or bake in a cast iron skillet) the steaks at 250 degrees for approximately 45 minutes or until the internal temperature of your steak reaches 120 degrees for a medium rare steak. I used a combination of cherry and hickory wood for this smoke. Remove the steaks from the smoker or oven to a plate and let them rest at room temperature. Melt the 3 Tablespoons of butter in the preheated skillet. 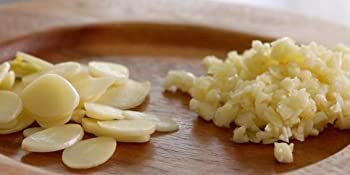 Stir in the garlic and salt and pepper. Nestle the shrimp into the butter sauce. 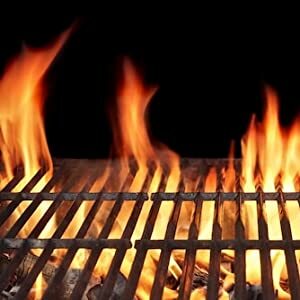 Close the lid on the grill and cook 2-3 minutes. Pour the white wine and parsley into the shrimp and turn each shrimp over in the pan to the cook on the other side. Remove the steaks to their individual serving plates. 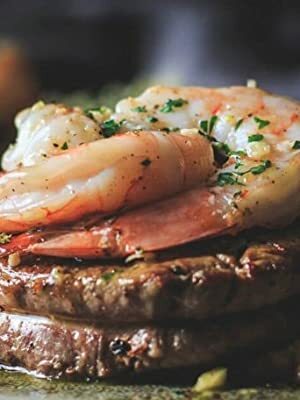 Top each steak with 4 of the shrimp and a spoonful of the garlic white wine melted butter. Serve immediately.